As industry pioneers and Ireland’s leading dry Ice supplier, we understand we also have a responsibility to advise and inform. Dry ice is very safe to use and if you follow some simple, common-sense guidelines. This page contains everything you need to know about dry ice safety, handling, and storage. How should dry ice be stored? Dry ice should be stored in an insulated container. This will reduce the rate of sublimation, making your dry ice last longer. WARNING: Dry Ice should never be stored in an airtight container. As the dry ice reverts to a gas, it will cause a potentially dangerous build-up of pressure in an airtight container. Ensure that the container is not completely airtight as the sublimation of dry ice to CO2 gas will cause an airtight container to expand or possibly explode. As a result of this, a certain amount of CO2 will inevitably enter whatever room you are using to store the dry ice. Hence the importance of keeping your storage room well-ventilated. Polar Ice can advise on suitable packaging and storage solutions for your dry ice. We have a variety of different options to cater for different quantities of dry ice, from 10kg to 1000kg plus. In small amounts, CO2 is harmless, but in larger quantities it can lead to shortness of breath or even asphyxiation. It is important to always use dry ice in a well-ventilated area. If dry ice has been stored in a room or vehicle for more than 10 minutes then you must open a door or window and allow adequate ventilation. Note: If you working with or near dry ice and suddenly find you are having difficulty breathing or are out of breath, open any nearby windows and vacate the area for at least 10 to 15 minutes. What are safe levels of CO2 in a room? 2,000 – 5,000 ppm Headaches, sleepiness, and stagnant stale air. Poor concentration, loss of attention, increased heart rate and slight nausea may be present. 5,000 ppm Workplace exposure limit (as 8-hour TWA) in most jurisdictions. > 40,000 ppm Exposure may lead to serious oxygen deprivation. Figures sourced from Kane International Ltd.
How should dry ice be handled? Dry Ice is extremely cold at a temperature of -78.5°C (-109.3°F). Touching dry ice with unprotected skin can lead to freeze burns or even frostbite. The severity of the burn depends on the duration of skin contact with the dry ice. 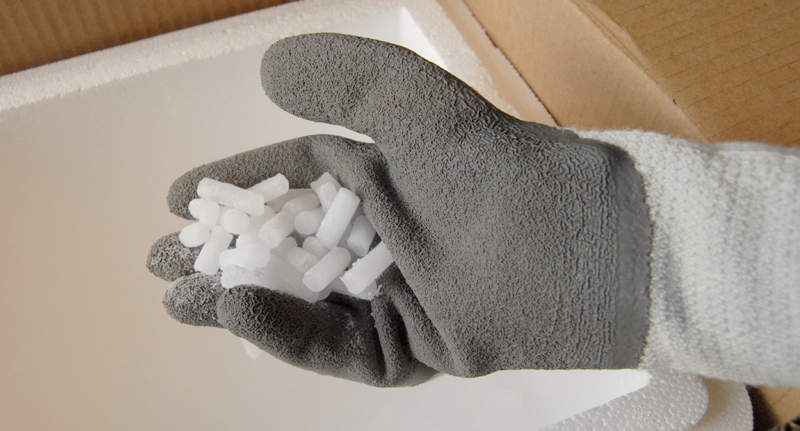 Always use gloves (preferably insulated) or protective cloth when handling dry ice. Dry ice can cause serious internal injury if ingested. In case of ingestion, consult a medical professional immediately. Dry Ice should not be put directly into drinks intended for consumption. ChilliSticks are a safe method of adding dry ice to drinks to create a smoke effect. How should I dispose of dry ice? When finished with your dry ice, unwrap it and leave it at room temperature in a well-ventilated area. This will help it to sublimate faster from a solid to a gas. Due to the CO2 released by the sublimation process, ensure that the dry ice is kept clear of people and animals. NEVER leave dry ice unattended around children or animals. Have you a dry ice safety query? If you have any concerns or queries about dry ice safety, handling, or storage then contact us today for expert advice. Tel: +44 (0)2843 758 045.